WINNIPEG - The last Canadian penny ever to be made shuddered down a chute and into a small glass bowl at the Royal Canadian Mint on Friday — marking the end of the line for the one-cent coin. Finance Minister Jim Flaherty, who got to push a few buttons on the giant machine that pressed the final penny, joked that the copper-coloured coin was falling out of favour even when he was a child. "I can remember ... my mother catching me throwing a penny in the garbage because I couldn't buy anything with it," Flaherty said. "We used to have corporal punishment in the old days, you know." Flaherty announced in his March budget that the penny would be phased out. Each coin costs the mint 1.6 cents to produce, and Flaherty estimates Ottawa will save $11 million a year. "The time has come to make the sensible decision to end production of the coin, which is underused by Canadians, no longer vital to commerce and ultimately a burden on Canada's balance sheet," he said. Even though the coins will no longer be made, they'll have to be accepted in transactions because they will remain legal tender. Credit and debit transactions will still go down to a penny's value. But for cash purchases, in the coming months, retailers will start to round up or down the tax-included price of items to the nearest five cents. Consumers paying cash for an item totalling $1.01 or $1.02 — tax included — will only be charged $1.00. Something coming in at $1.03 or $1.04 will have the price rounded up to $1.05. 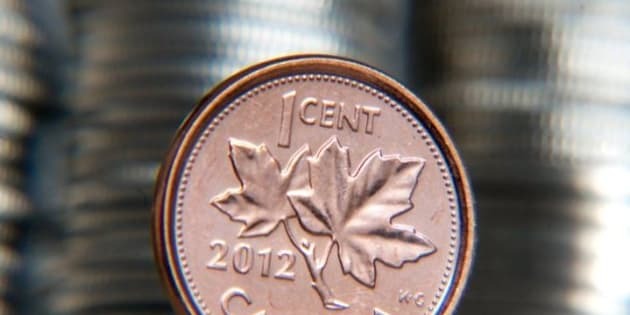 Canada joins several countries that have already dropped pennies or their equivalent, including Australia, New Zealand, Brazil, Israel and South Africa. Flaherty said the change in those countries was "very successfully. The businesses were co-operative and there were no issues." The first penny to be domestically struck was produced in Ottawa in January 1908 to open the first national mint. Lady Grey, wife of Gov. Gen. Lord Albert Grey, was there to oversee the penny's birth. The last one-cent piece is going to Canada's currency museum in Ottawa.